There has been published near every country their own SEPA Implementation guide. "Why, is ISO 20022 the standard? ", is the most common question. 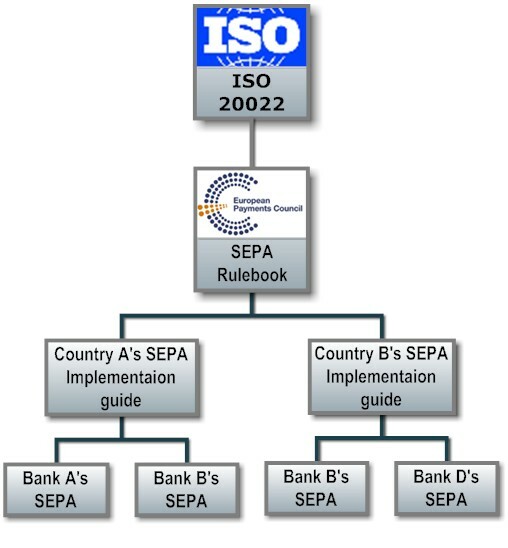 To understanding need of country and bank specific standards you have to understard the structure of ISO 20022 XML paym ent standards. The picture tells how a SEPA implementation guides has been evaluated. There are root /general standard ISO 20022 pain -messages. Because the structure of ISO 20022 is directional and loose that for business use there are need for more strict rules. Due to that European Payment Council has created SEPA payment implementation guides (Rulebooks) for SEPA Credit Transfer and SEPA Direct Debits. But although EPC's created implementation guides in cooperation with banks, the loca country authors have to create own implementation rules based on local banks and payments habits. In other side banks has their own legacy systems that sets own requirements concerning information that is needed to execute a payment in bank. This leverages banks specific implementation guides. If bank has branch more than one country it has to take into acoount also those requirements when bank is publishing a one common implementation guides to their customers.